Over 100 deans from law faculties across Indonesia convened in Jakarta to promote case law in legal education and enhance legal certainty for citizens in the country. Held under the IDLO-managed Indonesia-Netherlands Rule of Law Fund Program on December 5, 2018 in Jakarta, the conference was attended by leading academics from both countries, as well as high-level guests including the President of the Netherlands’ Supreme Court, Hoge Raad, and the Deputy Chief Justice for Development of Indonesia’s Supreme court, Mahkama Agung. 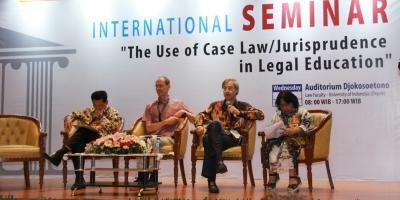 The conference was co-organized by IDLO together with the Embassy of Kingdom of the Netherlands in Jakarta, University of Indonesia, Atma Jaya University, and the Center for International Legal Cooperation. Ensuring predictable and consistent court decisions across Indonesia is a challenge. The country has 909 district and appellate courts, nearly 8,000 judges with approximately 5.5 million cases submitted per year. Different religions and sets of customary law across regions add further complexity, and the diversity of decisions makes it difficult for judges to properly analyze preceding cases and interpret the law. The lack of legal certainty not only poses obstacles for citizens’ access to justice, it also makes it more difficult for businesses to understand investment options, presenting barriers to greater economic expansion in the country. One reason cited for the lack of uniformity in judicial decisions is that case law has not been mainstreamed into legal educational curricula in Indonesia. Law faculties focused on the theory of law and existing legislation instead of integrating courses on the interpretation of the law or case law. Given the effect and power decisions taken within the highest court can have on other cases, new innovations within the Supreme Court also provide for opportunities to enhance consistency of judicial decisions in Indonesia. Professor Takdir Rahmadi, Deputy Chief Justice for the Development of Indonesian Supreme Court explained that with the recent launch of their website, over 3 million decisions can be accessed and analyzed online. Increased the transparency of existing case law provides court users with a sense of predictability when it comes to the law and can help current and future judges draft decisions consistent with precedent. The conference culminated in a joint declaration, signed by the deans of Indonesian law schools, to integrate the study of case law in course curricula at universities and promote legal certainty in the country through stronger education.